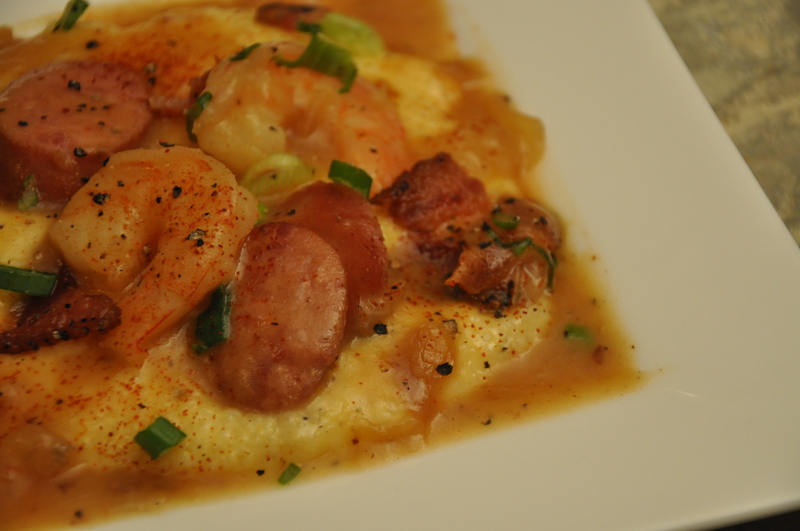 I would like to introduce you to my new best friend – Shrimp and Grits. Perhaps I should call this dish my boyfriend, cause I’m in love with it. I want to marry it. 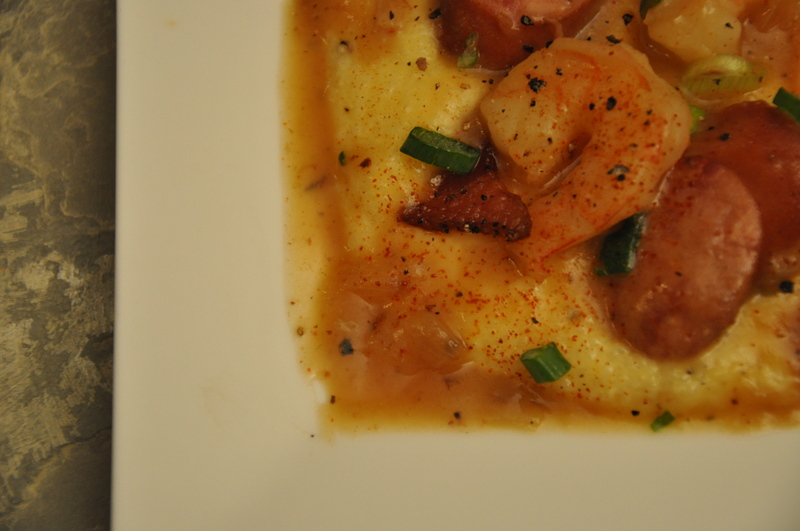 Nathan and I had never had Shrimp and Grits when we decided to make this. So, I can’t tell you that it’s authentic or that it tastes the way Shrimp and Grits should taste. I can tell you that it tasted great. In fact, Nathan was preparing to eat something else, but ended up eating this for dinner instead because it was so darn good. Follow the directions on the box for the instant grits. Most directions will use only water. Instead, add a mixture of chicken stock and water, and bring to a brisk boil. Add grits and ½ teaspoon of salt and cook five minutes covered over medium heat. At the end of the cooking time, mix in heavy cream, cheddar cheese and butter. Texture should be thick and creamy. Brown three slices of bacon in a deep skillet over medium heat. Remove the bacon and set aside. Add the onion and garlic to the bacon fat and sauté for 2 minutes to soften. Add the sausage and cook, stirring, until there is a fair amount of fat in the pan and the sausage is brown. Sprinkle in the flour and stir with a wooden spoon to create a roux. Slowly pour in the chicken stock and continue to stir to avoid lumps. Toss in the bay leaf. When the liquid comes to a simmer, add the shrimp. Poach the shrimp in the stock for 2 to 3 minutes, until they are firm and pink and the gravy is smooth and thick. Season with salt and pepper; stir in green onion. Spoon the grits into a serving bowl. Add the shrimp mixture, garnish with crumbled bacon and mix well. Serve and fall in love!